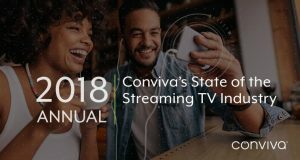 Video measurement and analytics company, Conviva, measured 165% year-on-year growth in global live TV streaming in the fourth quarter of 2018. According to its ‘2018 Annual State of the Streaming TV Industry’ report, there was 89% growth in overall viewing hours across Conviva’s customer base for the full year. Live content, which was up 65% in viewing hours, was found to drive significant growth in streaming, accounting for the largest global surges in viewership throughout 2018. Video on-demand viewing was up 111% over the same time period. “As streaming becomes a bigger part of their everyday lives, viewers continue to migrate toward devices and services that offer those best-in-class experiences. Data for the report was collected using Conviva’s proprietary sensor technology, which it claims is embedded in three billion streaming video applications.